The principles and basic setup of VoIP technology is fairly simple but the complexity of each individual implementation can vary considerably depending upon the requirements and the size of the business. The same applies for cost and time as well. A small business can get started with VoIP (specifically hosted VoIP services) in a matter of minutes and with very little expense. But a larger organization will have to spend considerable time and resources to set up a system that can accommodate all their needs. A lot of VoIP vendors advertise that hosted VoIP requires very little or no initial investment but the statement is not always true in every circumstance or for every business client. If your business has no more than two or three employees including yourself, then it is certainly possible to have an enterprise class VoIP phone service with zero investment. Most providers offer free soft phone applications as well as mobile software that can do the required job admirably. On the other hand even a small business with 20 to 30 employees will require VoIP desk phones or devices equipped with conference calling facilities etc. All of this will require some investment although it is certainly not as great as that needed for a typical landline deployment. The bigger an organization is, the more difficult it is for them to get by with just VoIP phone software. Soft phones or VoIP apps are not a new phenomenon. In fact most consumers are used downloading and installing a specific software for making VoIP calls (Skype, Facetime etc.) These applications can be downloaded to any desktop or laptop equipped with a microphone and speakers. After entering the required account credentials, the user can make or receive calls. Softphones for enterprise class VoIP services are not all that different from consumer applications. They are generally provided for free and can be installed on any number of computers by the client. Installation and setup doesn’t take more than a few minutes and employees can start using the phone service immediately. These applications act as SIP endpoints, similar to IP phones or mobile devices. Apart from a handful of self-employed professionals and small businesses that can depend on soft phones exclusively for their service, most organizations will use a mix of hardware and software phones. For instance, a company may purchase some VoIP phones for executives and allow the use of mobile VoIP apps or softphones for lower-level employees. It can be installed on a variety of devices at the same time – a workstation, a laptop, mobile phone etc. Secondly the circumstances under which softphones are used (while traveling, telecommuting, remote working etc.) generally lack security controls. It means that important business conversations can be overheard or data can be stolen. Hence many organizations restrict business phone use to the corporate network or allow access on business issued mobile devices. Generally VoIP providers offer a dedicated application for multiple operating systems and devices that can only be used with their own phone service. It provides them a degree of control and is viewed as a value-added service by clients. In reality, it puts businesses at the mercy of the developer as regards to updates and introducing new features. 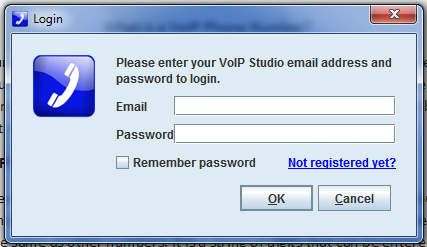 Precisely to avoid such constraints, VoIP studio offers a free softphone application for clients but does not restrict them to using only that particular software. 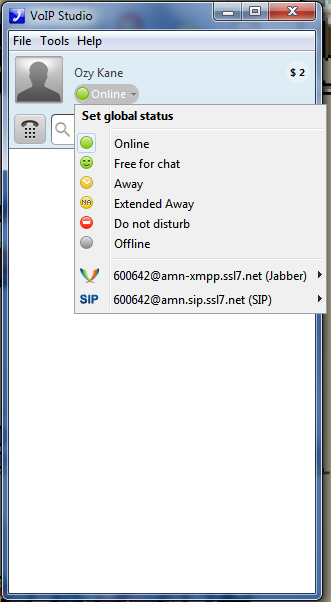 While organizations are free to use the open source based client, they can use VoIPstudio’s phone service with many popular third-party VoIP apps. It means that users are free to pick and choose the software that they like to use with the phone service. Users can download the application from the website of VoIPstudio. Simply select the operating system you have and the download will be automatically started. The application can be installed just like most commonly used software. 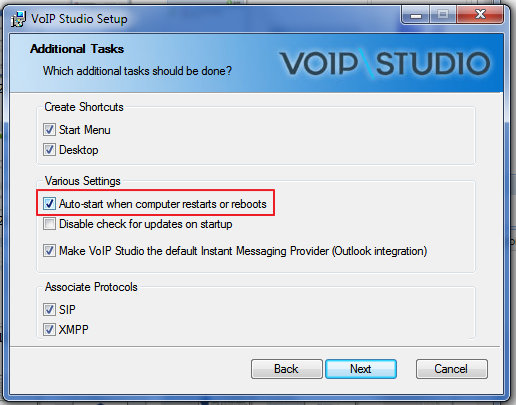 Users should check the box to allow the application to start with Windows, enabling them to make and receive calls at all times. During the installation process, you will be prompted to enter the username and password. Once setup is complete, users can immediately start making calls. Contact numbers and groups can be added easily or you can dial a number as well. 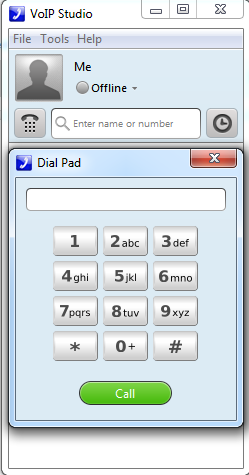 Presence information can be set from the drop down window and most features are available from the Tools menu. VoIP softphones may not be the best solution for businesses – at least not on their own – but they should be a part of every deployment because of their many advantages. They are yet another tool in the vast arsenal of features that make VoIP superior to older PBX systems and phone services.